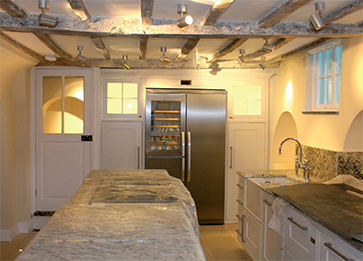 Triton’s technical sales team provided a waterproofing specification for Cambridge based architect, Oriel Prizeman, as part of the renovation of a 17th century vicarage. Platon cavity drain membranes were specified to waterproof the walls in the basement where a new kitchen was to be installed. Cavity drain membranes work on the principle of allowing water to continue to penetrate the structure but control it in the air gap and divert it to a suitable drainage point. The membranes are loose laid on floors and fixed to walls using special plugs and sealing materials, with little or no preparation required to the substrate. Depending upon which membrane is specified, wall surfaces can be dry lined or plastered directly and floors can be screeded or a floating dry board system installed. Contractors, Anglia Property Preservation, installed tough, BBA certified Platon P8 membrane to the walls that were subsequently battened and boarded to conceal pipework and cables etc. However the majority of the walls including the small archways throughout the area were waterproofed with Platon Plaster Mesh membrane as it can be plastered directly, thanks to its HDPE ‘twist’ mesh layer which forms a key for plasters or renders. The new floor slab incorporated Triton’s TT Admix to prevent the leaching of free lime and to control water ingress. The active chemicals in the TT Admix react with fresh concrete to generate a non-soluble crystalline formation that seals the concrete itself against the penetration of water or liquid. A concrete sump with recessed manhole cover was created inside the boiler cupboard and the internal walls waterproofed with Triton’s TT Vapour Membrane, a liquid applied, single component acrylic modified coating. Triton’s Aqua Channel was installed to the perimeter of the complete floor area, with regular rodding points, to direct any water entering behind the membranes to the sump where it could be pumped outside by the the Triton Aqua Pump Pro system. This system comprises two mains powered pumps, one providing additional capacity to the first if and when required. Triton’s Aqua Pump Battery Back Up Pump was also specified in case of mains power failure. The BBA approved sealed Platon system was completed with the installation of Platon P20 membrane to the total floor area. Platon P20 is a heavy duty membrane designed to manage high volume water penetration and therefore principally used on floors. Its 20mm deep stud profile is also designed to resist potential blockages caused by lime deposits. Further information about Triton’s complete range of cavity drain membranes, pumps and drainage systems is available at tritonsystems.co.uk including a full installation guide and technical drawings.